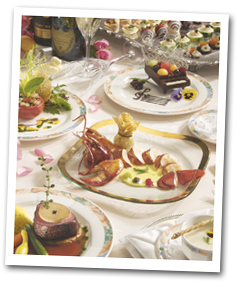 The ultimate in luxury & romance for special occasions! The ultimate in luxury and romance for special occasions! Be pampered at the exclusive Captain’s welcome reception on the top deck and new "Bon Voyage hula" welcomes you. 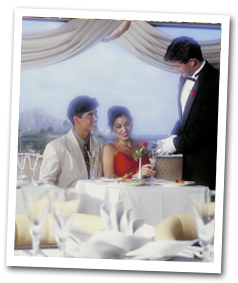 Savor a 7-course Signature dinner served to your private table in the top deck Super Nova® room, super premium beverages and live Jazz entertainment by some of Oahu’s top artists! Our feature show is a mesmerizing Jazz trio of some of Oahu’s top artists, with vocalist, saxophone player and pianist performing a wide selection ranging from nostalgic blues to current tunes. Plus, a variety of live entertainment, like no other, starting with the STAR’s pier-side welcome hula. At the Captain’s welcome reception, enjoy our Hawaiian music and hula dancer, followed by new "Bon Voyage hula," then soft piano music during dinner as we cruise along the Waikiki coastline. Super Nova Dining Room 4th Deck Capacity for Table Service: 130 seats Beautiful ballroom with exquisite Art Deco style interior, own bar, waiting lounge, restrooms, baby grand piano, own sound system, air-conditioning, and private lanais. Not recommended for children (under 12). Welcome Hawaiian Bellini and Three Super Premium Beverages are included. Additional beverages and special selection of vintage wine and champagne by the bottle available for purchase. Dress Code: For gentlemen: No shorts, T-shirts or flip flops. Not recommended for children (under 12).